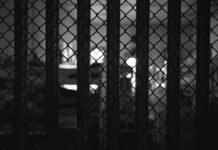 Editor’s note: On October 9th, a riot occurred at the Cadereyta Social Reintegration Center (CERESO), a state prison in Nuevo León, Mexico, in which 18 prisoners were killed and more than 30 wounded. That Monday…at night while I checked my notifications, I noticed a few that said “something” was happening at the Cadereyta CERESO. 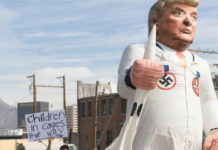 That phrase “something is happening” brought up memories of recent tragic events in Monterrey, for example natural disasters, massacres, and riots like the ones that happened previously at the Apodaca CERESO and Topo Chico Prison. Given the evident spread of this rumor, I decided to turn on the television to see the news, in search of corroborating it and being certain about what was happening. On the news programs – on Monday night and Tuesday morning – the first things I heard were statements from authorities who at that moment said it was just a fight among people deprived of freedom. Hours later I would realize that these initial statements were an attempt to dismiss what was actually occurring. Time, valuable time, that could be used to resolve the situation unfolding inside the CERESO. Hours later – midday Tuesday – the same authorities indicated that what happened was a riot. Similarly, that there had been three guards held by people deprived of freedom who were asking there be no more transfers to Cadereyta CERESO from other prisons. 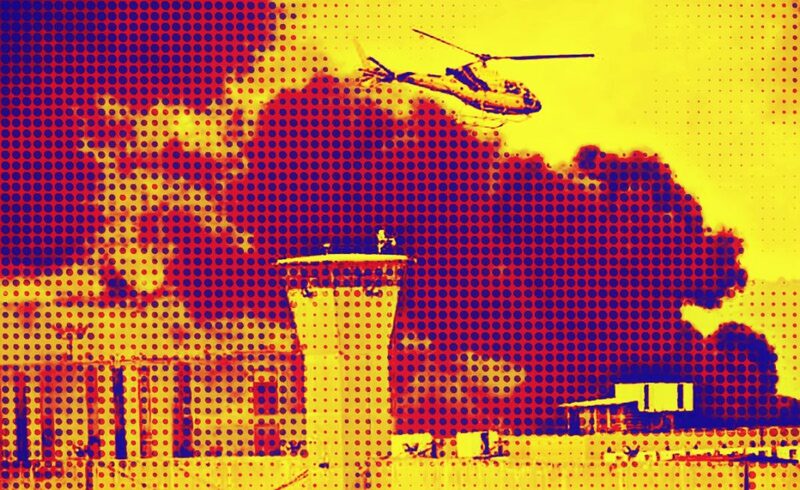 This request corresponded to the fear, anguish and terror created by the idea that those transfers would lead to a so-called self-government inside the prison. That is in no way an acceptable option, as with it silence, pain, rage, resentment and impotence hang like the Sword of Damocles over the people there deprived of freedom and whose tip extends its threat to their family members. 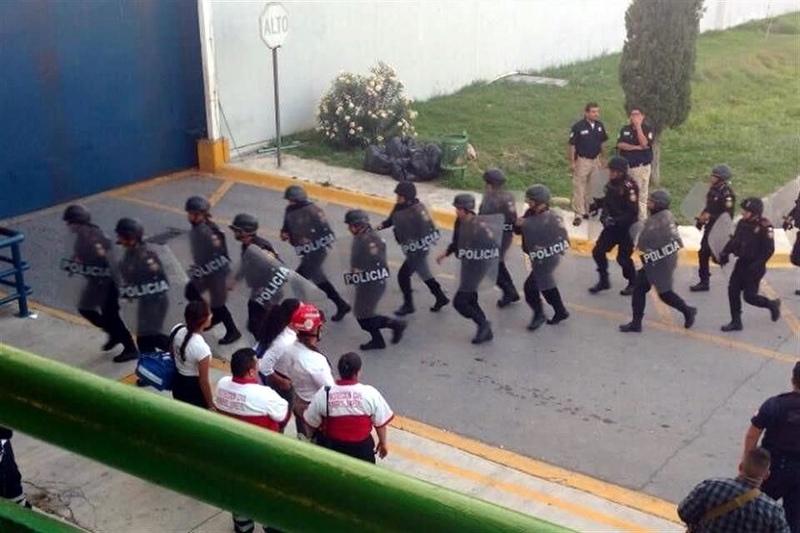 Police forces storm Cadereyta prison. All this happened in the midst of a cloud of smoke that split the blue sky and white clouds, like a sign of discontent with what the future might bring and like a cry that was lost in the silence of apathy due to the lack of information of what was happening. These unheard voices that protested due to the previously mentioned fear were quickly silenced by R-15s, 9mms, tear gas, and the classic baton, silencing forever the voices of 18 people – but even more – breaking, injuring and bruising not just the people who were repressed, but also their families and Nuevo Leonese society itself, a society that’s stayed silent and said nothing in response to these events. A society that perhaps can’t perceive that it itself is injured, broken, silence and repressed. 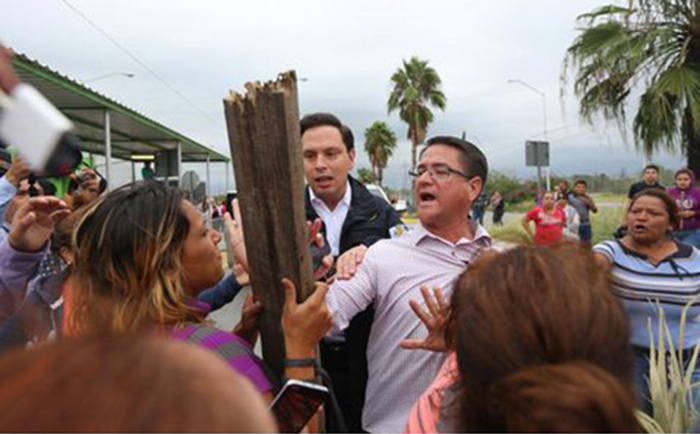 The family members of prisoners demand answers from Nuevo León Attorney General Bernardo González Garza (in jacket). Events that were justified with saying like: “The lives of the kidnapped guards and of those in custody were at risk” “we must use the force of the state” – which is embodied by the police, the guards, the institutional or penitentiary forces, the army and the CERESO administration, who let loose their sublimated or repressed genocidal instincts and picked up a gun and fired, a baton or nightstick and swung. These actions were justified by and rooted in official discourse that supports their violence in the interest of “the common good” and of the important, inviolable, immovable and obtuse “security”. So it is that a complaint, a demand, a silenced cry turns into a massacre and raises questions such as: Who gave the order to fire? Who approved it? Who fired? And with respect to the investigation: What was the chain of custody used to collect the bullet casings? How many casings were found? Does that number match the reported number of bullets fired by police and prison forces? Were casings found only for weapons officially approved for use? Was there an investigation into the trajectory of the bullets? How many deaths were from a bullet to the head and from what distance? How many deaths were from a bullet in the back? How many deaths were from stray bullets? Where are the people whose relatives have requested visits but who still haven’t been located? Relatives who are receiving as answers: “We didn’t find him” “Go look in the University Hospital”, being that, according to reports, the lists of wounded and deceased have been closed. These and many other questions pierce the mothers, partners, fathers, siblings, children and other relatives with pain and uncertainty. Since early Monday they were at the green gate – which is the first or last door, as the case may be; because from here, no matter the case, the CERESO extends its gray walls, creating victims of those deprived of freedom and their families. Victims who in expressing their anguish and pain, be it peacefully, desperately, with shouts, pushing the gate, or throwing bottles and other objects over the gate, received as replies: “Later we’ll give you the chance to enter” “There is no visiting at the moment, please leave” “Go home”, innumerable answers in this tone, but also giving answers by spraying them with a fire extinguisher (to make it hard to breath and diminish visibility), with tear gas and shots from at least four pepper ball guns, as well as the inevitable pushes, punches, insults and baton strikes. 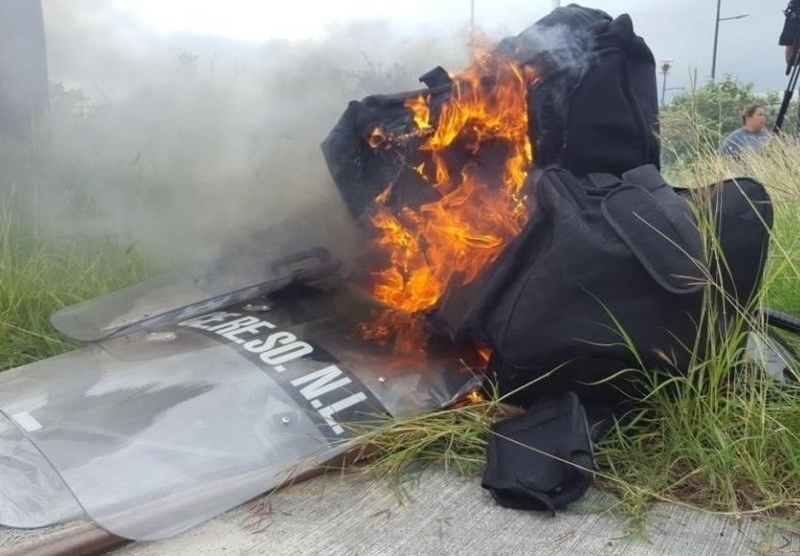 Riot gear set on fire by protesting family members. Here it’s worth asking if the revictimization of the families is due to an unusual response to an unusual situation or if it is the very professionalism that the police and prison forces are taught at the University of Security Sciences? Is this the protocol that should be followed for women, children and men who were rightfully asking for information about their relatives inside the prison? These acts show what the words, statements and institutional jargon seek to hide. Now, is this a mere recounting of events or an effort to show the necrotic relationship that exists at the political and institutional level? A relationship where deciding who can or should die has little relevance, as since they are people deprived of freedom it’s believed that “they have no rights” “they are thugs” “they did society a favor by killing them” “let them kill each other”, statements that are typical not just of most people working in the public security sector, but also of the majority of people in society. A fact that displays their punitive, stigmatizing and discriminatory core. These views are not well-founded but they establish a baseline. 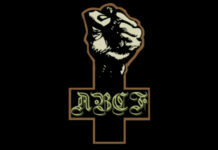 And from there the phenomenon of necrosis is created, which justifies, accepts and promotes the killing of those who dare to break the established rules, norms or laws. 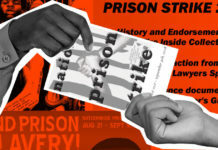 It dehumanizes those who are imprisoned – without knowing a thing about what it is like to live in that situation – as well as their families and all those who think or say that those deprived of freedom have rights that much be respected. In such a way, these politics and institutions normalize and applaud the death of my partner, of someone like me, or of the Other. We must ask ourselves, what future lies on the horizon of this thing we call life when the State asks family members to accept a death certificate attributing the death of their relative to natural causes when they were killed by a gunshot?